This study has 7 sessions, incorporating an introductory session and 7 lessons. 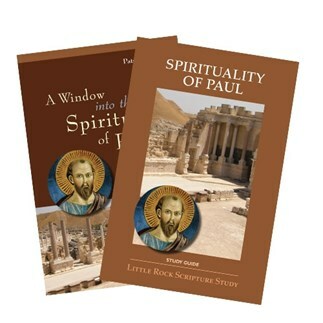 The Study Set includes the Study Guide by Clifford M. Yeary and a commentary A Window into the Spirituality of Paul, by Patrick J. Hartin (Liturgical Press). Patrick J. Hartin is an ordained priest of the Diocese of Spokane, Washington. He presently teaches courses in the New Testament and in Classical Civilizations at Gonzaga University. He is a contributor to Give Us This Day and the author of numerous books, published by Liturgical Press, including: A Spirituality of Perfection: Faith in Action in the Letter of James, James (Sacra Pagina series), James of Jerusalem: Heir to Jesus of Nazareth (Interfaces series), James, First Peter, Jude, Second Peter (New Collegeville Bible Commentary series), Apollos (Paul's Social Network series), and Exploring the Spirituality of the Gospels. Explore key biblical passages from the early church's most influential evangelist and discover the rich spiritual tradition of Paul that continues to influence believers today. This study draws us into the power of Jesus' cross and resurrection not only in our lives but in the lives of key historical figures who embodied Paul's spirituality. Lecturers: Clifford M. Yeary, John Hall, David LeSieur, Karen Wenzel, Catherine Upchurch, Betsy Wiederkehr, and Matthew A. Glover.